We hear it all in Washington, and one thing we can agree on is a good whiskey. That’s why Filibuster Bourbon is launching a new bourbon from right here in the nation’s capital. Filibuster’s official launch party is at The Passenger on Wednesday, 9/12, 5pm – 8pm. Details and RSVP here. Restaurants include: The Passenger, Corduroy, The Pug, New York Avenue Beach Bar, Room 11, Posto, Pulpo, Floriana, Bourbon Steak, Kangaroo boxing club, Art and Soul, Matisse, Barrmys, Bistro B. Stores include: Modern Liquors, Schneider’s of Capitol Hill, Sherrys Wine & Spirits, Central Wines & Liquors, S&R Liquors, 1 West Dupont Circle Wines And Liquors, Cairo Liquors, Paul’s Chevy Chase Liquors, Harry liquors, Ace beverages, Magrutters. The bourbon has its roots in the great American whiskey tradition. The Washington area has a rich history in whisky. The Ricky was first mixed in the District with bourbon back in the 1880s, on E St. at DC’s downtown Shoomakers Bar. The surrounding Appalachian range has long been home to distilling operations – sometimes controversial – dating all the way back to America’s founding and our famous Whiskey Rebellion. 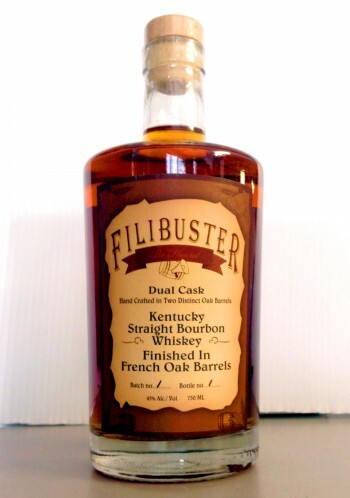 As a modern twist, Filibuster uses the same French oak barrel aging process that’s known for making fine wine – it adds depth, complexity and elegance. We call our unique process “Dual Cask” – it’s what makes our whiskey stand out from the crowd. The French oak barrels we select to age our whiskey in have been used to age wine. The longer a barrel is in use, the more subtle its contribution to the flavor of the finished product. The tighter grain and subtle flavor profile of these older French oak barrels adds a degree of elegance and finesse to the finished whiskey – with a layer of stylish complexity that really pulls all the components together.